Qantas’s first Boeing 737-800 to feature the airline’s new livery has entered service after being repainted in Singapore. The aircraft, VH-VXM, operated QF72 from Singapore to Perth on Thursday night after spending two weeks in the city-state being repainted. The updated livery and kangaroo logo was launched in October 2016 to coincide with plans to introduce the Boeing 787 into service in late 2017. It is only the fifth livery to be introduced since the kangaroo first appeared on Qantas aircraft in 1944, and the first livery refresh since 2007 ahead of the Airbus A380’s introduction into service the following year. Qantas said the updated branding would be completed across the fleet by the time the airline celebrates its centenary in 2020. So that’s, what…two jets painted in the new scheme in 6 months? There are still a couple of 737s and Dash-8s getting around with the scheme that was replaced in 2007! Looks classy, i like it. Ive always wondered why the inside of the winglet’s were never painted red like the outside was. Look forward to seeing it in the flesh. @ Jason Nope four jets. 3 A333 and now 1 B737. The plan is all by Qantas’ 100 birthday in 2020. Sure it doesn’t have paws but still looks classy and modern. Maybe next time poor Skippy won’t have a tail?! Why aren’t they repainting them here in Australia? The A330s have been repainted in the US and now the 737s in Singapour. Wouldn’t it be easier and cheaper to repaint them here? Virgin did so by sending their fleet to Townsville to be repainted. Shame on Qantas for not spending the money here. How can you have a skippy without front feet? Now it looks part alien. I’d like to know what the aversion is to the kangaroo again having a set of wings. Jasonp, if you look at the line up of liveries above it would be apparent that the livery changes since the 1984 change have been so minor that only a plane nut would take much notice. Hardly any point in rushing through a repaint of an entire fleet when the change is so minor. Unlike say Virgin who did a complete rebrand where yes it is important to get the fleet done ASAP. There are a number of reasons why aircraft are painted overseas, one being a skilled shortage. In my time in aviation and aerospace this has always been an issue. Certainly not helped by the changes to 457 visas. The new paint scheme looks very cool. As far as I know there is no facility in Australia to paint A330 size aircraft and larger. I think the biggest Flying Colours in Townsville can repaint is the B737. Some of the aircraft may be repainted by Flying Colours but given the number, time it takes (ie number of days) and the number Flying Colours can do at a time, the majority will have to be painted overseas. The biggest Flying Colours can do is up to Boeing 757. 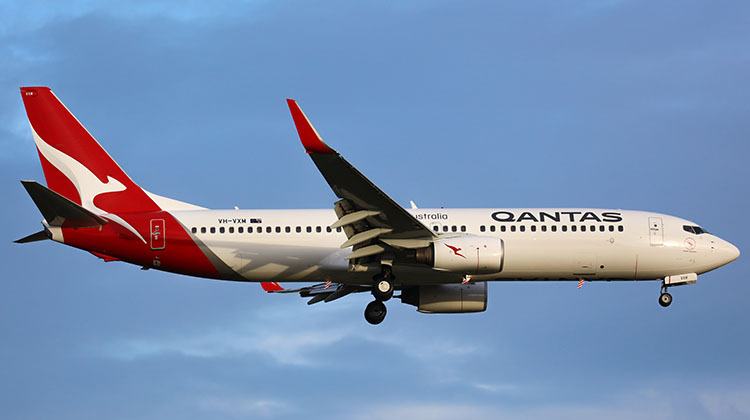 They’ve just opened a second line up in Townsville and someone told me they now have the capacity and staff to be able to complete 50-55 aircraft per year, so there’s no reason for Qantas to go overseas for aircraft B737 and smaller, obviously they can’t do the wide body. Qantas want the livery refresh to be completed by November 2020, 50 aircraft per year starting now means they could easily complete 150-160 aircraft which is most of the narrow body/regional fleet. Qantas should be supporting local industry if the capability exists here (which it clearly does). Supporting the Singapore economy has no benefit for Australia. I’d love to see one of the Q400’s that are well overdue for a paint to be done in old Australian Airlines livery from the 80’s. I think it would make an excellent Retro Roo III. It would also be a nice acknowledgment to the often forgotten domestic origins of the current Qantas. Is the paint shop at RAAF Base Richmond still operational? I remember seeing many large civilian jets getting painted there in the past. To the uninitiated, the image on the tail looks like a stylised graphic, of nothing. There a reason there is a skill shortage in Australia. Companies like Qantas and Virgin like outsource these skills instead of being world leaders. Soon there will be no maintenance done in Australia for these airlines if the current trend continues. I’m sure these planes could be painted at Avalon near Geelong. They definitely have the hanger to accommodate most large planes. There are plenty of skilled people from the now defunct automotive industry that would relish the job. @Dale – I agree an Australian Airlines livery would look fantastic. I think the livery was only around for about 7 years between when TAA became Australian Airlines and when Qantas merged with them. Nevertheless the Australian Airlines livery was very colourful and I think still would look great today. Boo-hiss, bad old Qantas sending work overseas. Let’s roll out the punching bag again! Sure if Flying Colours had no other customer they could complete all of the Qantas aircraft in time. God help them if this was their business model to have a single client using all their available capacity. They should and do have other clients both local and overseas clients. They have been painting Virgin and Tiger fleets (including repainting Virgin 737’s in Tiger livery), plus Qantas, Jetstar, Cobham and many other clients who will all have slots scheduled during the next few years. Shame on you QANTAS for not supporting Australian interest. Get rid of this stylised logo. Put Skippy’s paws on and wings if you want. Do some real artwork. It’s not that hard. So will the 744-ERs get the paint job? I know they’re retiring the -400s, but I think the ERs are staying in service. Crazy they’re actually going ahead with this ridiculous livery. @TSV It’s good to see that Flying Colours has been able to expand and build the business. but your view that Qantas should send all their B737 and smaller business to Flying Colours is misguided. Flying colours have a capacity which is by all accounts in demand so available slots may not match when aircraft are available to be repainted. A B737 takes at least 3 days to repaint so it is scheduled months in advance for the repaint and maintenance. So it’s a matter of finding a paintshop that has the slot available at the time. Their A330 200 and A380 will look amazing in this new livery. Can’t wait to see. Qantas’s fleet of 200 odd aircraft have been committed to have this new livery by November 2020, averaging around 66 aircraft per year if it was spread out evenly (which is the most logical way to do it, you can spread out the cost, fleet impact etc). If Qantas say only committed to 30 aircraft in the first year, that means they would then need to paint 85 aircraft over the subsequent years, find 85 slots, fund 85 slots and fill the gap of 85 slots. Much harder to do. Basically, if Qantas want to have this livery successfully completed when they want, they NEED to make the aircraft available when the paint shops have slots, not when it fits their schedule. Virgin did it successfully, I’m sure Qantas can as well or they’ll have egg on their face, although their history of livery changes and repaints isn’t the greatest… aircraft still flying around with gold stripes! I would assume that paint slots don’t grow on trees which I’m sure Qantas either knows or will find out very shortly, so you could probably link the recent expansion of Flying Colours doubling their slots to this repaint program, sure they have other customers but why not try and grab most of the work? Risky? Yeah a little bit but I’d be annoyed watching work go overseas because of capacity constraints, Flying Colours have obviously seen this and taken the risk to grab a bigger slice of the pie. Regarding maintenance costs, Alliance went to Europe for TOTALLY different reasons other than cost, sure it was cheaper but they got massively bitten, it was done to clean out their engineering staff. Virgin’s fleet age is younger than Qantas’s so it’s maintenance requirements are not as heavy at the moment. Plus Virgin’s business model wasn’t built on doing heavy maintenance in house. Looks good. I never liked the italicised QANTAS — this is much more elegant. Flying Colours can pain 55 per year and you reckon Qantas needs to paint 50 per year. I’m sure they’d love to get Flying Colours to do all of them but what do you suggest happens to the other customers that have already booked space at Flying Colours… you reckon Qantas should just force them out and get priority because they just decided to change their livery??? Secondly, aeroplanes make money when they are in the air. If there are other facilities such as LT that have more up-to-date methods and equipment and can get a quicker turnaround, plus the volume of aircraft to do, it makes sense to send them overseas. If the successive governments hadn’t kept ‘liberalising’ everything where Australian workers have to compete with cents an hour then all the paint shops that were here in Australia years ago would still be going. It’s not as simple as just saying FC can do 55 per year, thus Qantas should send all their aircraft there. It’s a nonsense to suggest they can just click their fingers and handle that much extra work. Struth! Forget all that painting/slots/heavy maintenance verbal. Good on ya! QANTAS Board…………………………..not! Wholly stuffed up my completed QANTAS scale model collection. haven’t ya!! Now faced with either selling my house or extending my model exhibition room just to accommodate & pay for the new range of models – all because you decide on a wingless marsupial with no hands. What next – no middle leg? Bring back the paws!!! That is all!! Garbage design. The Roo looks like one of those blades they throw in Kung Fu movies or a plastic dental floss pick with a handle. You want livery…? Check out Fiji Airways, Ethiad, Emirates, Lufthansa, Singapore. Bold, Assertive, Classy. What if one came back from some other world and saw a QuaintArs tail for the first time. Would that Alian be able to say it is definitly a Kangaroo??? First QantasLink Fokker 100 returns to Perth on Wednesday from Wagga Wagga in the silver roo paint scheme. Flake, I was in the Douglas hangar here in Wagga last Friday. Can say that the little Fokker looks sweet! Now for the new slogan to go with it… QANTAS – the flying fish-hook. Where’s the QANTAS on the aircraft belly, or is that on wide bodies only? Maybe it doesn’t look right with the 737 main undercarriage stowage arrangement? 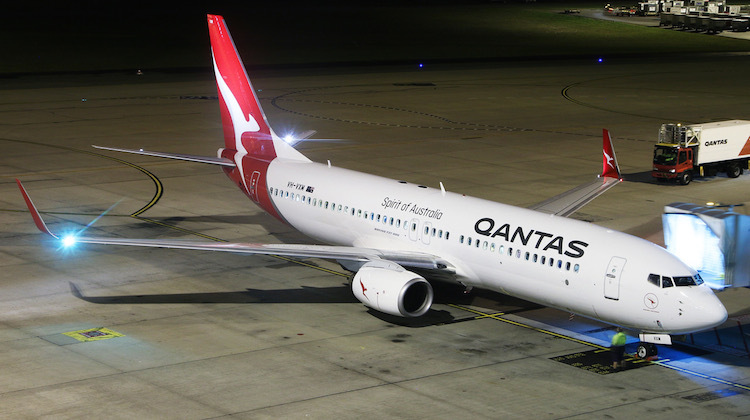 @andrew mcg – the word QANTAS is written on the belly. It’s forward of the wheels underneath business class. “QANTAS” in the new font looks good and I have no problems with the kangaroo image. But please oh please delete the words “Spirt of” – and just leave “Australia” Many people round the world don’t understand “spirit” in this context, especially in Asia. Its academic to me in any case. I don’t fly with airlines that close down rapidly and leave their customers mostly abandoned round the world. Any good CEO should be able to fix industrial problems without going to this extreme – that’s what he gets the big money for. I am an ex QF Platinum FF – very ex! I guess Skippy will lose his ears in the next iteration of the logo and start looking more and more like a boomerang.